Whether you have an old belt, coat, pair of shoes, or a piece of leather furniture that has lost its luster, caring for dry leather is important. Not all hope is lost if a piece of leather has become dry. Some people might think that the item has to be thrown out because the leather will never look the same, but that's not true. Conditioning a piece of dry leather can give the item a new look. Treating dry leather is not as hard as you might think. Dry leather is easy to spot. The color gets dull, the item might become stiff, and it could begin to crack or flake. In extreme cases, the leather item could begin to fall apart. Dry leather furniture is no longer comfortable to sit on, and it can also begin to peel and look worn out. If the leather has become thin from use, dryness can cause it to tear or form small rips. Treating dry leather is a must if you expect to prolong the item's life. Washing with leather soap and warm water will help give the leather the moisture it needs. In addition, gently brushing the leather and then following with a cold water rinse will help treat the leather. After washing and brushing the leather, it should be dried without the use of heat. Air-drying is ideal, as long as the leather is not left out in direct sunlight. Leather dressing should be used to help restore pliability and softness to the leather. This should be done after the leather has completely dried. There are a few options that can be utilized when applying leather dressing. 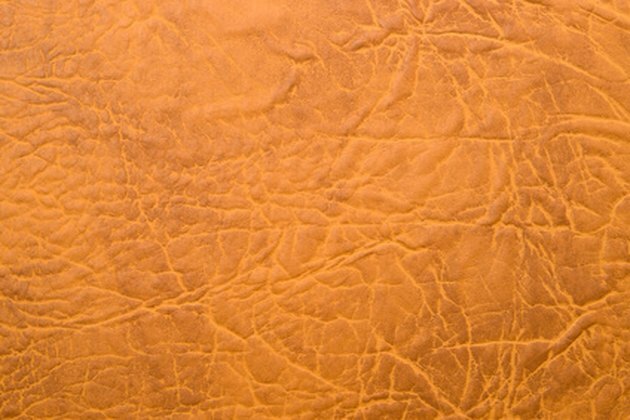 A homemade mixture of glycerin and alcohol can be used to dress leather. However, products such as mink oil can also be used to soften leather. Mink oil is probably the easiest way to treat leather, because it can be found in most general merchandise stores. Furniture stores also sell leather dressing for furniture. If a piece of leather has become so dry that it's beginning to fall apart or is showing signs of cracking, treating it by washing, brushing, drying, and applying leather dressing will not help repair the damage. These processes will help the unaffected areas of the item, but cracks and tears in leather cannot be fixed with treatment. If the damage has occurred on a piece a furniture, an upholstery shop may be able to fix it. Treating dry leather can prolong the life of leather. Treatment should actually begin before the leather begins to show signs of being dry. Early treatment will ensure that the leather does not rip, tear or crack. In addition, washing leather will help remove body oils, salts, atmospheric soils, and common soils that can collect on leather when it is used regularly. While maintaining leather products at home is a good idea, taking them in for a professional cleaning at least twice a year is also wise. Jennifer Garcia has been a writer for several years, and currently lives in the Southwest as a reporter. She's had stories published in several Freedom Communications newspapers on the East Coast, as well as the "Santa Fe New Mexican" in the Southwest. Garcia's first job was at a newspaper, where she worked as a telemarketer. She studied journalism at Northern New Mexico College.